I have been pursuing an organic lawn for 10 years. I must admit that until a few years ago, it was not going too well. I would amend my soil based on soil test results, but it was not producing a consistently healthy lawn. Note my objective here is not a golf course-like monoculture of lawn perfection, but a demonstration that organic lawns can be healthy and nice looking with a similar outlay of money as chemical-based lawn care. I have recently, in the past two years of two, been surprised by my results. The change was the result of going to a presentation by Paul Tukey and then reading his book "Organic Lawn Care Manual ". Paul recommends several steps in his book, some obvious and some not. One of the obvious suggestions was to use compost tea to increase the microbial life in the soil. Vermicompost tea is the immediate choice for me. 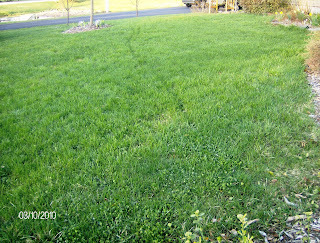 Also, using a grass seed that is low maintenance and hardy in your climate. His recommendations made sense to me, so I decided to try it. After a few years of doing it, I am a believer and I have learned a few things. For your information and comparison, I am including sources and prices in this blog so you can see what I spend on supplies and tools. 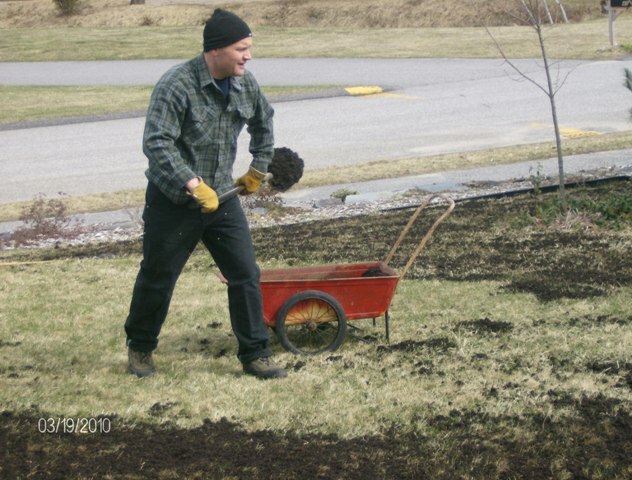 One of Paul's not so obvious recommended changes was to top dress the lawn with compost. 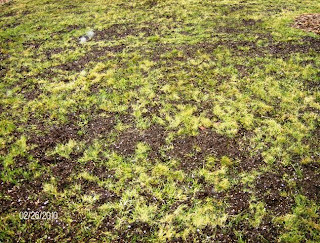 You overspread the grass with a thin layer of compost-- not so much you smother it! This compost filters down into the turf and eventually reaches the root level. 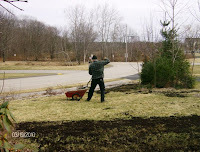 When I stared, my lawn was growing in 2-3 inches of topsoil above sand. There was no way grass would thrive when it could not root deeply. The other recommendation was to use gypsum instead of lime to increase pH (my soil test told me my pH is still a bit to acidic). Gypsum has calcium rather than magnesium as the cation salt. Calcium prevents soil compaction whereas magnesium promotes soil compaction. I prefer pelleted gypsum because it is easy for me to spread it by hand. According to the results of my soil test and the recommended application rate, I applied 5# of pelleted gypsum. Before you start making changes to your lawn care program, I suggest you contact your local cooperative extension to get a soil test kit. Standard tests for lawn (turf) is $15 plus shipping. That's around $20 for a detailed analysis of what you need to do to address deficiencies in your soil. 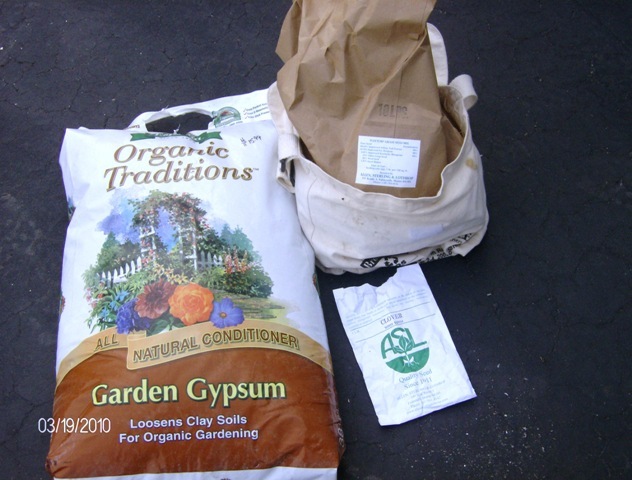 Some people like bagged compost, but I prefer to get bulk local organic compost ($203.80 delivered for 4 cubic yards*) and supplement with some (about 1 cubic foot*) of my vermicompost (FREE!). Bulk compost is cheaper and does not make such a mess of the car, but you have to move it around with a garden cart instead of carrying bags. *Why 4 cubic yards? My total lawn area is a little less than 5000 square feet. If I assume 1/4 inch of compost on the entire grassy area, I will need 104 cubic feet to cover (5000 square feet x 1/12 inches to feet x 1/4 inch depth).4 cubic yards is 108 cubic feet, plus my 1 cubic foot of vermicompost = 109 cubic feet. That is enough to do the job. 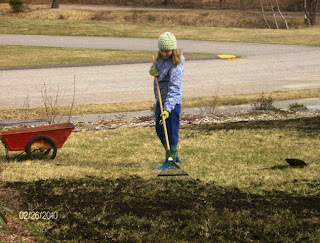 The objective here is to add organic material to the soil and correct any nutrient deficiencies while adding more grass seed to fill in any bare areas. First thing you need to do is prepare the soil. I do this by raking off the dead grass, any stray leaves, and sand from winter and then core aerating. Several years ago I tried powered aerator that I rented and swore I would NEVER do that again. It was a heavy intractable beast that I could not safely control. I found a manual core aerator that is slow but safe. I received a pair of those spiked shoes several years ago and think they may be better for killing subsoil grubs than for aerating. The core aerator leaves little tubes of soil on the lawn that break down. 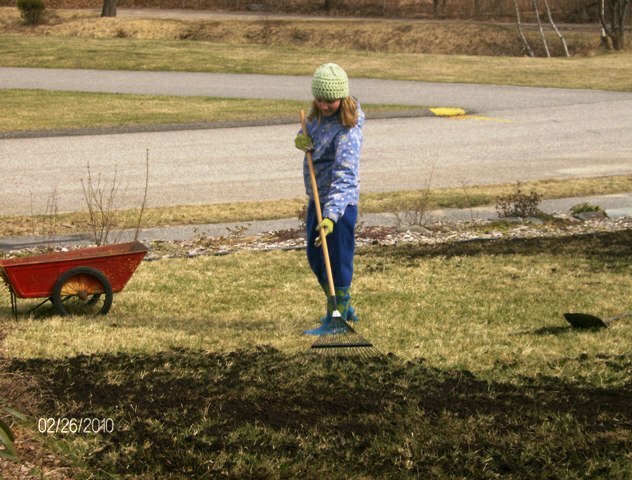 You can rake and core aerate a few days before seeding and overspreading the compost. 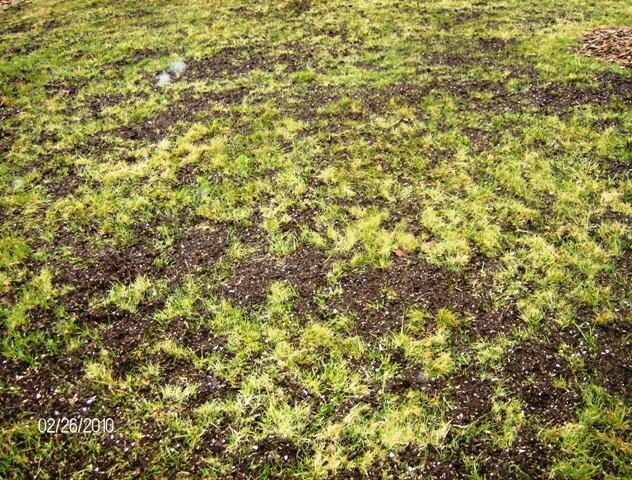 The day I overspread the compost, I also over seed with Allen Sterling and Lothrop's Tuff Turf grass mix and white clover (www.allensterlinglothrop.com). I use a mix of 9# Tuff Turf to 1# white clover ($22.50 and $8.25, respectively). I don't actually mix these (the clover seed is much smaller than the grass seed). Instead, I hand cast each over the area of my lawn after raking and core aerating, but before I spread the compost. I've gotten pretty good at hand casting, and I trust it more than the mechanical spreader that I can never get just right. At this time, I also hand cast the gypsum. I purchased gypsum locally for $6.03. I prefer to move the mixed compost with my garden cart and a shovel. Then I spread it around and break up any clumps with the back of a bamboo rake . The objective is not an even layer over the lawn that you rake in and it goes away. Nope. Instead it is a somewhat uneven layer of compost that is hidden in some areas and really visible in other area. My tip is to try to time the seeding and overspreading to happen right before a big spring rain event. The rain will water in the compost that is on top of the soil. 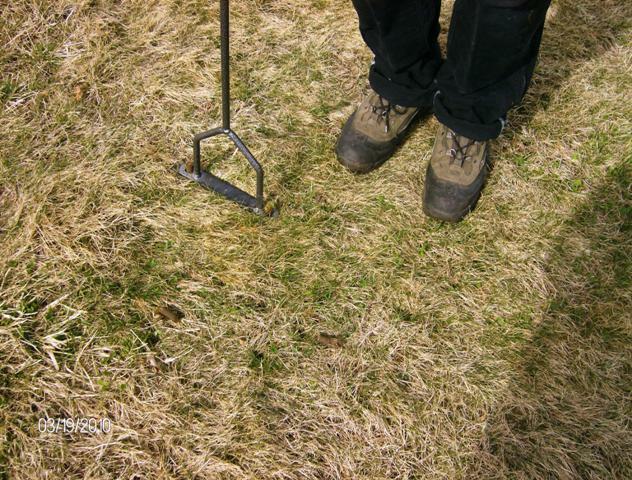 To get good germination of the grass seed, you want soil temps at least 50F. This is a sweet spot in the year that you can hit if you watch your lawn soil temp with a soil thermometer and keep an eye on the weather. This year I timed it to finish last weekend (just before our big rain this week). 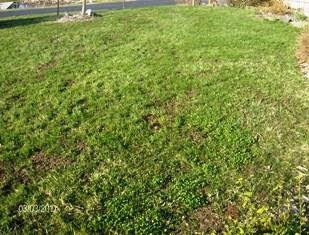 I will post some photos so you can see that after 2 weeks the compost is gone and the lawn is green. I will periodically water the lawn with vermicompost tea, but I never water during the dry periods we sometimes get. The lawn goes dormant and then I don't have to mow (hooray!). In time, I hope to build up enough soil under the lawn (6-8") to not have to add compost (3-4 more years at my current application rate), and I am only adding gypsum until the pH stabilizes to a higher level than it is now. At some point, I hope to have to only rake, over seed bare spots and core aerate. Yes, this is a lot of work. 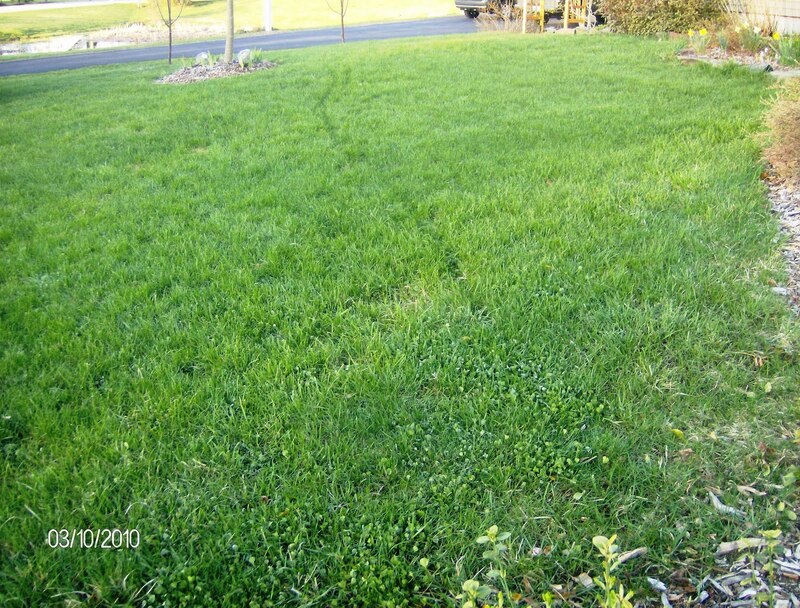 And it takes time to wean your lawn off of chemicals and bring life back to your soil; however, it will pay dividends this summer when you do not have to weed, water, or fertilize. As oil becomes more expensive, petroleum-based fertilizer and herbicides will only become more expensive. Your lawn is an ecosystem that you can nurture using organic methods and free yourself from the expense and danger of chemical lawn care. I hope you try it. By the way, my total outlay in money (I have the tools I need already) was $260.58 (soil test, 4 cyds of compost, grass and clover seeds, and 5# gypsum). I used all the compost, clover seed, and gypsum. I have approximately 3/4# of grass seed left to patch as needed this summer. That is all the money I will spend this year on my lawn (not counting electricity and a few tablespoons of molasses to make vermicompost tea). I could top dress again in the fall, but I typically don't. Kate is using the metal rake. She found that easier for her. I prefer the width of the bamboo rake. 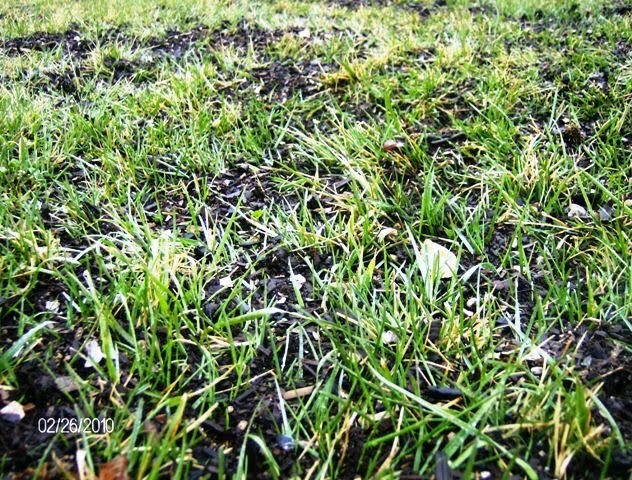 April 5 update: Here is a photo of the lawn after 1 week (below). As you can see, the compost is making its way down into the turf. April 12 update: Here is the lawn after 2 weeks (below). All the compost has moved down and the grass is a nice healthy deep green. nb. Terry Soloman (formerly of Vermont Compost) suggested I try core aerating after I overspread the compost (to work it into the turf and soil better). I have not tried this method, but I would welcome your thoughts on this. Great info here Mark. Thanks a lot! BTW, my worms are doing great since we met in February. Mark, thanks for information and helpful pictures. We need a soil test and just to dig down and see how much soil is there in the bare spots. I really appreciate your organic focus and seeing photos of your lovely helper. Thank You for the pictures! I got top dressing done a couple of days back and was nervous about it being uneven and looking messy but I guess it should be fine in 2 weeks.